Shorelines on Hamilton Island is a group of luxury 2 bedroom, double storey townhouses on the marina side of Hamilton Island. Sought after for their location and breathtaking west facing water views. 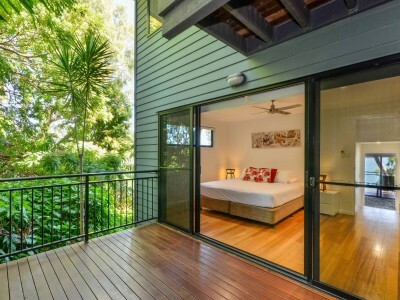 These self contained apartments on Hamilton Island are the perfect choice for your next Hamilton Island holiday. All include a buggy and some even include free wifi, Nespresso coffee machine and champagne on arrival. These exclusive apartments on Hamilton Island have access to both the Shorelines shared pool and also the stunning infinity edge pool at ‘The Edge’ apartments – located in front of the Shorelines apartments. 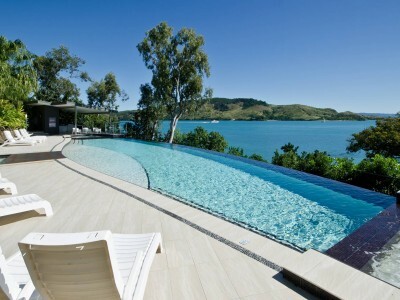 Accessible only with a security key provided on arrival, the infinity edge pool right on the waters edge is definitely one of the many bonuses for choosing Shorelines on Hamilton Island for your holiday. "Hi We had a fantastic holiday! Lovely place to spend a holiday, fantastic views and also very good furniture. I am recommending it to all my friends to stay there Cheers Steven kelly "
"Hi The Whitsunday Holidays Team, Thank you for your email regarding our holiday at Shorelines 33 in Hamilton Island. We had a FABULOUS TIME. We had our friends from Florida USA with us and wanted to show them a little of what Queensland had to offer. They have previously visited TNQ especially Port Douglas. We are from the Gold Coast, so they have spent quite a bit of time with us here as well. I was the only one of our group who had been to Hamilton Island previously - having sailed in the regatta a number of years ago. I was amazed at how much the infrastructure had grown since I was there last. We especially found the IGA and Bottle Shop such great value considering its isolation. Our holiday certainly lived up to and exceeded our expectations. The apartment was beautiful with stunning views, impeccably clean and well resourced and stocked. We especially loved the infinity pool and were grateful to work off all the extra calories on those stairs! As we were on a mission to have a great pina colada, we especially utilised the blender in the apartment. We will certainly book the same apartment again as we have been raving about our holiday to all our friends. We are a couple who holiday three times a year with at least one overseas trip included. So please believe us when we say how much we enjoyed this one. Thanks again. Cheers Kaye "
"“Really great property! Looks exactly like the pics! Great location, very clean and modern, and the communication was excellent! Would definitely stay here again!Thanks for the stay. Loved the property and appreciated all your quick responses. I’ll be back! !” "
"Beautiful location and the use of the buggy was handy and also lots of fun. Clare"
"Lovely accommodation and stay ★★★★★ We thoroughly enjoyed our stay on Hamilton Island and Shorelines 33, in fact so much, that we will be back. The infinity pool was a definite highlight. The freedom of having a buggy was awesome and fun. Phyllis"
"Hello, We loved our 2nd stay at Shorelines 20. My mum who came with us this time was blown away by the facilities and the view (as were we the 1st time too). We loved all the improvements/changes that had been done since our last stay in Shorelines 20. Very nice to see a few of the things fixed from last time and fresh coats of paint and new couches etc. Our son loved the Xbox and games supplied, the DVDs also great to see, we wont need to bring our own for "just in case" next time. We will definitely use this holiday house again. It is fantastic. Layla"
"Hi Whitsunday Holidays Team! Please let the owners know we thought the property was great! We had a group of us there, using 4 different properties in Shorelines and I think #33 was probably the best. Thankfully all the other families we were with had kids with them and they were all next to each other so we used theirs instead of ours which made it easier! Looking at the other properties, #33 certainly had more available to use in terms of the kitchen appliances and had the best fridge our of the lot! Only suggestion to improve the stay might be a good coffee machine like a Nespresso machine to make coffees in the morning. Otherwise… it was a lovely place to stay and if we come back, we’d certainly look to book #33 again. Have a great week and thanks for a great stay. " "“Awesome location and views.” "
"Thank you for sharing your little slice of heaven with us! We have been to Hamilton Island around 10 times tried a few different places & settled on the Hibiscus units as our favourite while the kids were younger but we will definitely be bringing them with us next time & staying at Shorelines next time...I think it will be our next favourite! We would also like to put in that our valet (sorry don’t remember name) was fantastic such an enthusiastic young man with a real interest in making a short trip with him interesting Regards, Renee "
"Hi, Thanks and we were very happy with the accommodation. We did want to make special mention of Isaac who arranged transfers to and from airport/unit. He demonstrated a very friendly, positive and helpful attitude that enhanced our holiday experience. Mark"
This Shorelines website is owned and operated by Whitsunday Holidays, the Whitsunday and Hamilton Island Holiday experts.